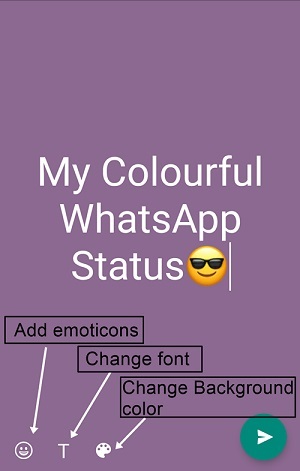 WhatsApp 2.17.309 has just rolled out a new feature known as the colourful or the colored text status. Now along with a video or audio you can set colorful text with emoticons as your WhatsApp status. The colored text status can also be edited and you can change the text font and change the background color. 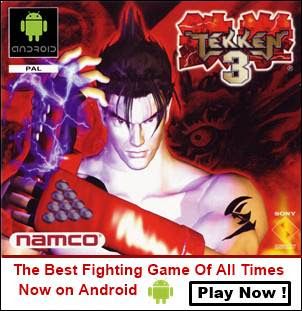 But the text color will remain white by default. When you navigate to the 'Status' tab in WhatsApp you can see two buttons on the lower right side. A green camera button for image and video statuses and a pen icon button only for text statuses. So if you want to get this new feature then first update the app to version 2.17.309. After installing the latest version open the app and tap the 'Status' tab. Now tap the pen icon to open the text editor. Type your text status. Tap the 'T' button to change the font and tap the color tray button to change the background color. Touch the emoticons icon to add smileys and emoticons. 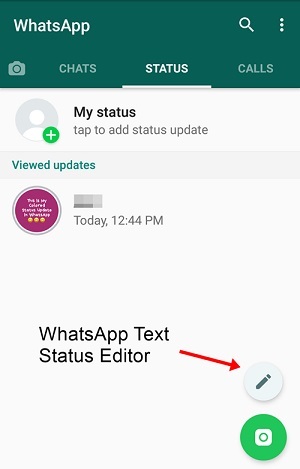 Finally tap the green send button to update your WhatsApp status.